I marvel still, when I turn onto Chemin Kingsmere and see the lights of L’Orée du Bois, that only 15 minutes have passed since leaving Centretown. The amazement stems from years spent in Toronto, where the idea of leaving downtown to access a rural restaurant in the woods on the edge of a village for a 7 o’clock table would be an unthinkable ordeal. We are a lucky lot. Intimate, formally appointed, and redecorated since my last visit, L’Orée du Bois is run by Chef Jean-Claude Chartrand and Josée Brunet Chartrand. The rest of the team, front and back of house, are all named on the menu — a rare and thoughtful touch. The other rare sight is white linen tablecloths! Remember those? And servers garbed in traditional black and white, presenting a menu that offers up fare like fish soup with croutes and rouille, braised sweetbreads, rabbit kidneys with mustard sauce, duck with green peppercorn, and crème caramel. Twenty years ago, menus like this littered the Capital region. In fact, I’ve saved many of those menus, storing them in a box in my basement filed under the category: ‘Traditional French’. Today, there’s no more than a sprinkling left and of those, only a few who execute the labour intensive cuisine well — L’Orée du Bois is one of those “few”. Chartrand’s a la carte menu is bolstered with a seasonal menu. After being seated, we are invited to create a four course table d’hote ($47) with no shortage of choice and with many options for paying a bit more for luxury items. Top picks among the starters are the deeply flavoured fish soup, with croutes and rouille, the caramelized onion soup warmed with allspice, the creamed cèpes with flaky feuilleté, and the smoked fish — scallops and salmon, united with herbed goat cheese and studded with capers and raisins. 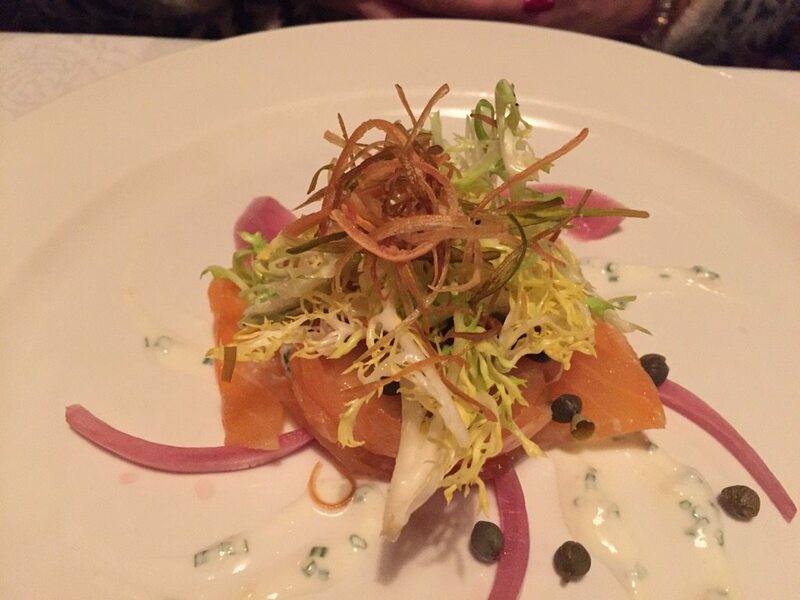 It comes with dressed frisée topped with a crispy straw of fennel threads. Of the mains, the duck confit on a bed of barley studded with mushrooms and artichokes is almost splendid, but for the bird’s flaccid skin. The barley is prepared ‘risotto style’ plumped with wine and stock. It comes mingled with a mix of Le Coprin mushrooms and darling little Chinese artichokes (also called by the less beguiling-sounding ‘crosne’), which have a sunchoke flavour and texture. 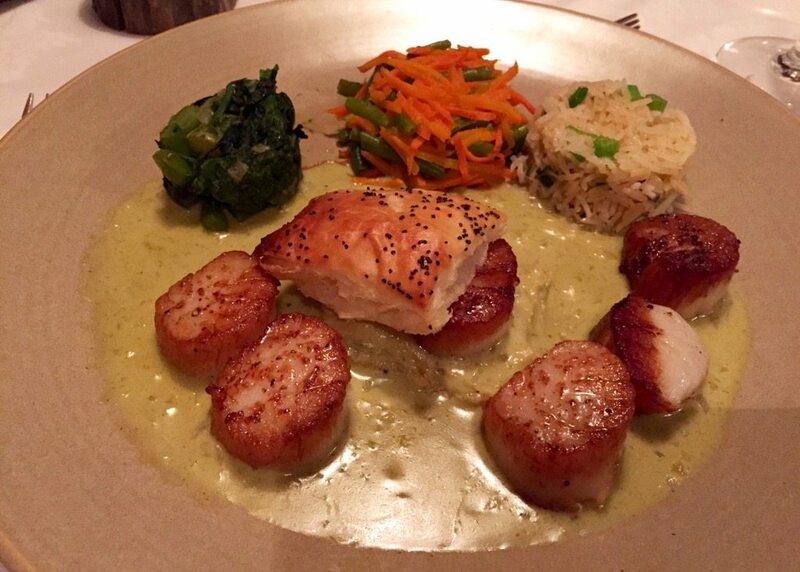 Scallops are impeccable, perfectly cooked, set in a ginger-lime and leek cream and surrounded by three timbales: of basmati rice, of bitter rapini with sweet grapes, of chopped green beans and grated carrot. Old school precious-looking, but richly delicious. And man oh man, speaking of rich, this is the place for foie gras. The lobe of fatty liver arrives lightly cross-hatched, creating a dark, penetrating sear, while the insides are creamy and dreamy and lightly wobbly. 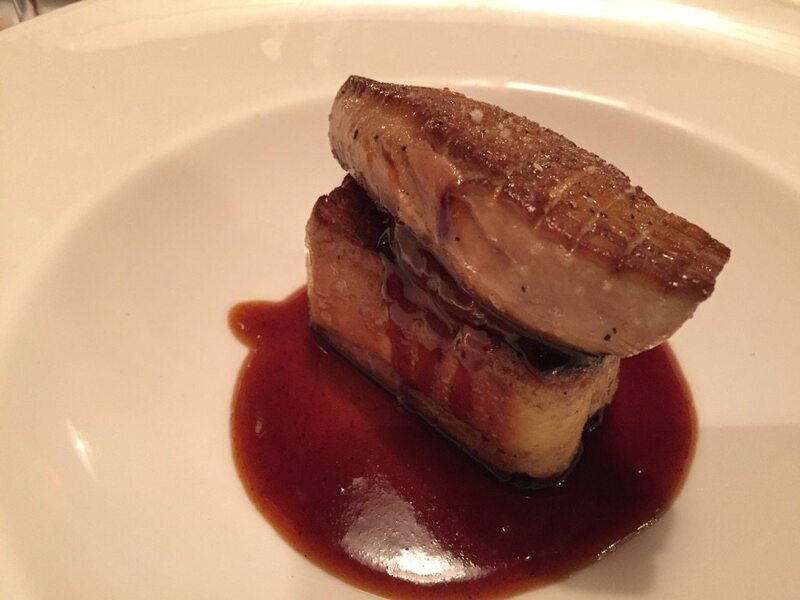 It comes perched on a tower of caramelized brioche sandwiched with stewed quince, and set in a polished cider gastrique. Magnificent. We settle on the crème caramel with Triple Sec, candied blood orange crowning the top. 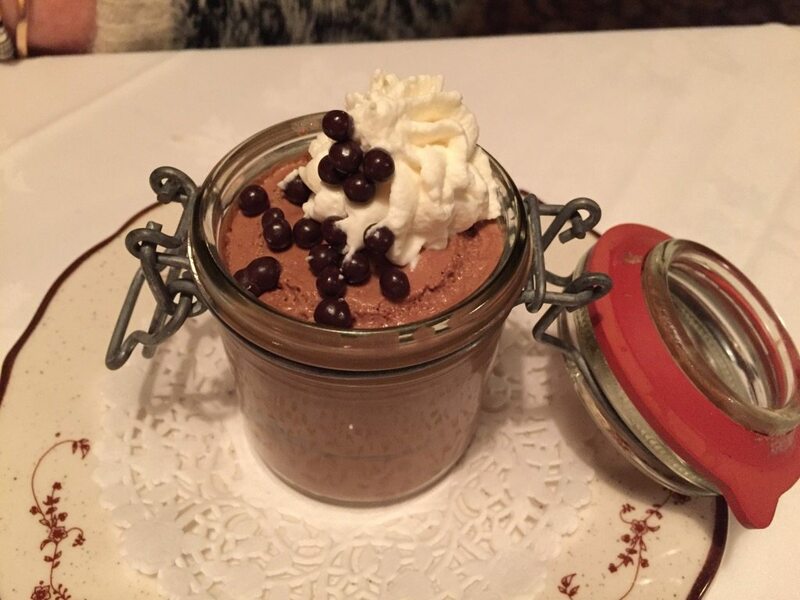 Chocolate mousse in a preserve jar is licked clean. House chocolates for the ride home… 15 minutes door to door.